Last month I attended a weekend course on Reflective Practice led by Thomas Farrell. This year, one of my own goals has been to attend to my own professional development instead of leading workshops, giving presentations and all that. As the French say, “reculer pour mieux sauter” – stepping back so to jump further ahead. I had a great time, thinking about my own teaching practices and sharing my own struggles and development with fellow teachers at Brock University. During the workshop I thought a lot about the question of: “what is reflective practice” and came to the conclusion that we too narrowly define this within our profession. Most of us think that reflection is about writing long journal entries or attending day long professional development sessions. I see it differently. Reflective practice is the simple act of thinking about our teaching and it can happen while on the toilet, or those 5 minutes after the kids have scattered from class. On the bus or a few notes to self written on our fridge. While reading on a weekend getaway or flipping through a newspaper. It isn’t just a formal act. But most importantly, it is an act that results from teachers caring about their students’ learning – not their own career or development. What further impressed me while reading the book was his continual espousing of the view that “thoughtful reflection” in and of itself is not the goal, only a means. Key is that it is done in a way that leads to constructive changes in teaching behavior – that it is reflection for action. I found the book very well organized and really easy to dip into. Not something a teacher needs to read at one go. Each chapter is structured into short parts with writing tasks that a teacher could do in their teaching journal. Reflective writing while learning about reflective writing – a kind of loop feedback and an approach that would make the book suitable for a professional development course. Particularly strong are the “Preamble” sections beginning each chapter. I really enjoyed how the author kept things personal and related his own experiences as they applied to the topic at hand. 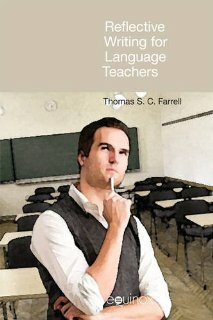 I gobbled these up and in fact throughout the book, you’ll find a lot of personal backdrop and discussion based on experiences all English language teachers can relate to. There were a number of sections that I wished were more thorough. In particular sections on teaching beliefs and the last chapter “Reflecting for Action”. There might also have been a detailed section on blogging as a form of reflective writing in its own right (and I consider this blog my PhD in reflective practices!). Although I’m asking for a lot, I also wish that books like this would have an online community or forum where teachers could actually reflect/write and share with each other. I’m an idealist I know but if your vision doesn’t exceed your reach – what’s a heaven for? If you get a chance, catch one of Thomas’ presentations/lectures – you’ll enjoy his ability to hold an audience’s attention and through humor or meaty facts get teachers thinking critically. As he quotes Dewey that “reflection is a form of freedom from routine behavior because reflection emancipates us from merely impulsive, merely routine behavior” (p. 153) – you’ll get lots from this book to push you out of your own habitual teaching practices and beliefs. PS: Visit Dr. Farrell’s webpage for more info. I’ve used reflective writing as a key part of my own courses. Read a sample of reflections my student teachers wrote using my own Zen and the Act of Teaching reflective teaching journal. To become a reflective practitioner, share openly one’s reflective practice with others in order to better reflect on other perspectives related to one’s local educational context. I think we are beyond reflecting in isolation.